That phrase, “it could be worse” is one I heard a lot two weeks ago and it continues to echo in my mind and heart on a daily basis. That one little phrase and the sentiment behind it have taught me something I needed to learn, and something that will most likely take me the rest of my life and beyond to actually live. It all started early Saturday morning, October 25. About 7:00AM my husband got a phone call from the hospice nurse that had been caring for his mom for the last year and a half. Yes, that’s right, a year and a half. My mother in law had moved to assisted living and been put on hospice care in April of 2013 with end stage COPD and heart failure. 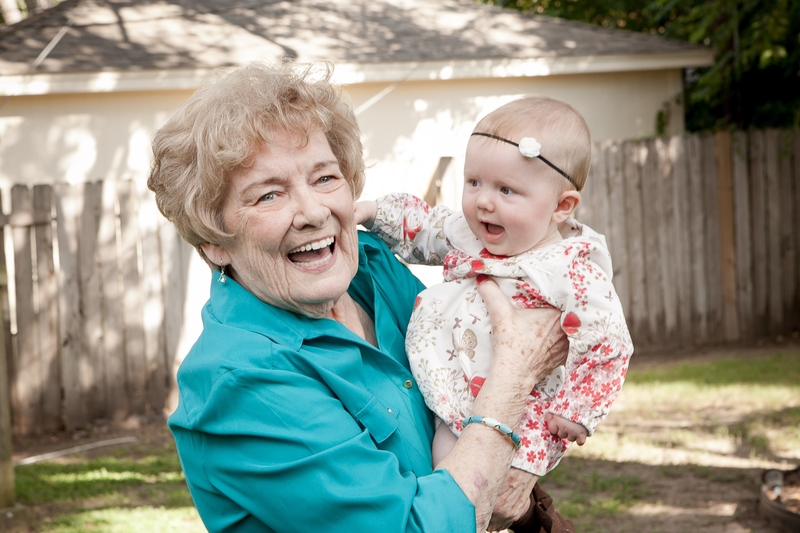 I truly believe that the nurturing care she received through hospice and the joy she experienced in getting to know her great-granddaughters were what extended not only the length of her life but the quality. It’s amazing how much our bodies and spirits are tied as one, even when we fail to recognize the connection. Dolores had even gotten strong enough to enjoy the fellowship of her meal time table mates and to develop pleasant and friendly relationships with both staff and residents. They all loved her. But, back to this particular Saturday morning… Dolores had fallen in her apartment and broken and dislocated her hip. Tom rushed to the assisted living facility to find her sprawled out on the floor, with the hospice nurse lying beside her, gently stroking her hair and talking quietly to her. It was quickly decided that she would be taken to the hospital across the street for evaluation of her injury and possible solutions for her pain. There quickly was assembled a team of doctors to oversee Dolores’ care. This was immediately uncomfortable for her and for us as her family because for the last year and a half there had been one medical professional, the hospice nurse, who had taken the trouble to get to know the person of Dolores as well as her condition. She was a person we trusted completely for Dolores’ care. Now there was a crowd of people involved, and wherever two or three are gathered there will be disagreement. (I have no chapter and verse to give you on this truth.) What happened next was something like entering The Twilight Zone. The orthopedic doctor told us that she had four fractures and a dislocation of the hip and the surgery was mandatory. If they didn’t operate she would die of a broken hip and it would be a worse death than the death of COPD and heart failure. The cardiologist told us that she was not a candidate for surgery and that to consider it was unthinkable. There was an internist, supposedly overseeing all, who was nice enough but didn’t really seem to want to commit one way or the other. And all during these discussions there was Dolores, lying there patiently while everyone talked around and over and at her as if she was some kind of specimen instead of a person. Tom, my husband and the most awesome man ever, put a halt to things and took the time to honestly and gently lay it all out to her and considered with her the options. It was a long day and it is not necessary to pour out all the details here but, the end result was there was no surgery. The anesthesiologist was the voice of reason. He said that she was not a healthy candidate for surgery and that even though she had a DNR, they are void in the operating room. He would undoubtedly have to intubate her during surgery and she would be on life support an undetermined length of time…in other words, there was no good news to this day. She would be bed ridden until she died and the goal would now be to minimize pain and infection until that happened. I’m sure explaining that to her was one of the hardest things Tom ever had to do. When she had heard and understood the gravity of the situation, she said in her most pronounced Brooklyn accent (born and raised), “Well, what’s my choice. It could be worse.” It could be worse??? Seriously? This woman was just told the absolute worst news anyone could hear and she’s seeing how things could be worse. It was stunning. For the rest of that day and the next two days we worked to get her out of the hospital and back to the assisted living, back to the care of her competent and compassionate hospice nurse. All day Monday, the 27th, my husband patiently navigated through the waters of excruciating hospital bureaucracy as Dolores quietly lay there slipping away before our eyes. Everything had been taken away from her. She could no longer walk, or even ride in a wheel chair. She could no longer sit up. She barely had the energy to eat. Even the hope of any kind of quality future had been pronounced null and void. We couldn’t even bring her great granddaughters (her true source of joy) up to the hospital to see her. And yet, in the midst of all this, she used what energy she had to say thank you to the nurses who cared for her and cracked jokes about how she guessed this meant no more dancing. She repeatedly thanked Tom, Lauren, and me for being there for her. Dolores had faced many tough losses in her life. Her dad before she was even old enough to remember knowing him. Her husband when she was only 53. Her adult daughter. Every close friend she ever had. She had faced the good and the bad with the same dry humor and perspective that she was showing us now. “It could be worse”, she would say. And now, in the midst of brokenness she was expressing gratitude for her life, because she saw it had been good. It was almost as if the worse things got the clearer she saw, and was grateful for the gift of life itself. Right before the ambulance came she started saying that she thought there would be a surprise party for her soon. We thought it was just her lack of oxygen saturation and falling blood pressure talking. Shows what we knew. The paramedics wheeled her into the assisted living lobby right as dinner was over and the residents were walking or being wheeled back to their rooms or to their evening activities. Tom, Lauren, and I had been talking about how we wished they weren’t bringing her in in the middle of this chaos. This was the “worst” timing we thought. We couldn’t have been more wrong. Everyone stopped as Dolores was brought in. “Hi Dolores! Welcome home! We missed you!” As sick as she was, she lifted her head and opened wide her paling blue eyes, and gave her biggest smile. As if this was a party being given just for her. Within an hour she was gone. Surrounded by the three of us gently touching her arm and whispering words of love and encouragement, she peacefully and quietly let go. The hospice nurse was not even in the room yet. I guess Dolores was right all along. Things really could’ve been worse. She had spent the last day of her life surrounded in love and care by those who meant the very most to her, her family. All the way to the end. Or to the beginning. You see, I’m quite certain there was another surprise party waiting for her. One that will never end. Dolores was no saint. She had her strengths and weaknesses, her sides of light and her sides of darkness, like the rest of us. In her full humanness she taught my family and me much about the nature of gratitude in her last few days. As long as there is life, whether it is in this physical realm we see and touch, or in the mystery of love that’s beyond what we see, there is always the invitation to be thankful. And when we can see our way to be thankful in the moment for life as it is, we can begin to understand the truth that…it could always be worse. This entry was posted in family, Lessons Learned, Life, life and death, Uncategorized and tagged hospice, itcouldbeworse, lessonslearned, lifeisagift, thankfulness. Bookmark the permalink. Tears rolling down my face while I smile broadly… Jane, you have captured Delores’ essence as well as the Essence that filled her last days and your hearts! Thank you, thank you for sharing this Life experience with us all.